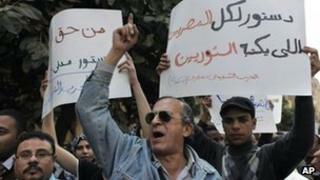 A court in Egypt has suspended the 100-member assembly appointed last month to draft the country's new constitution. Several lawsuits had demanded Cairo's Administrative Court block the decision to form the panel as it did not reflect the diversity of Egyptian society. They said women, young people and minorities were under-represented. Islamists from the Muslim Brotherhood's Freedom and Justice Party and the Salafist Nour party, which dominate parliament, have a near-majority. Liberals and secularists fear some of them would like to amend the constitution so that it follows the principles of Islamic law more strictly. Once the assembly has produced a draft, it will be put to a referendum. It had been hoped that would take place before May's presidential election. The Administrative Court did not give the reasons for the ruling to suspend the constitutional assembly, stating only that it had halted "the implementation of the decision by the speaker of parliament" to form it and had referred the question of its legitimacy to a legal adviser. "Illegitimate" was the cry that went up from campaigners celebrating outside the Cairo Administrative Court, after news came through of its ruling. The judge said he was suspending the assembly drawing up Egypt's new constitution and referring the question of its legitimacy to a legal adviser. "This is great, it's very reassuring and I'm very happy," said Hala Gamal of the Women and Memory Forum, a civil rights group. "The formation of the constitutional committee was illegal, unconstitutional, so that is why we resorted to court. It was totally unrepresentative of Egyptian society, not only women but students, workers and peasants." "It's an historic ruling," added Abdul Jalil Mustafa of the Egyptian Association for Change. "They suggested a committee in the sense of the Islamic political current and yes this is a part of Egypt, but not the whole." The Muslim Brotherhood's Freedom and Justice Party, which controls more than half of parliamentary seats has said it will appeal against the court's decision describing it as "political". Campaigners nevertheless celebrated outside the court when news came through of the ruling, which followed complaints by political groups and constitutional experts over parliament's decision to select the assembly itself and to allocate half the seats to sitting MPs. "The constituent assembly is unrepresentative of Egyptians," said the advisory council of the ruling Supreme Council of the Armed Forces. "A new constitutional declaration should be issued... specifying how the constituent assembly is formed. Article 60 of the current declaration was so vague that it has left the assembly in the hands of one force." The Muslim Brotherhood's Freedom and Justice Party said it would appeal against the court's decision, describing it as "political". Secular and liberal parties have already withdrawn from the assembly, believing that their presence was only conferring legitimacy on it. Some members are planning to draft an alternative with all parts of society. Al-Azhar University, one of Sunni Islam's most important institutions, and the Coptic Orthodox Church of Egypt have also announced a boycott. The FJP disputes that Islamists, who control 70% of the seats in parliament, dominate the constitutional assembly. It says only 48 members are Islamists - 36 from parliament and 12 others.